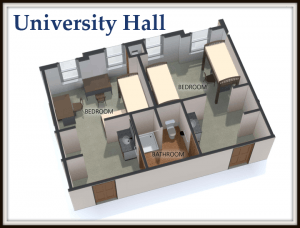 University Hall is a co-ed suite-style housing comprised primarily of upperclassmen. University Hall is a co-ed suite-style housing comprised primarily of upperclassmen. Each suite has two bedrooms, two dressing rooms, and a shared bathroom for four people. Each bedroom comes furnished with one twin extra-long bed, one desk, one dresser, one chair, and one closet for each student.